This week was one of those weeks where a bunch of random seemingly unconnected events all converged. 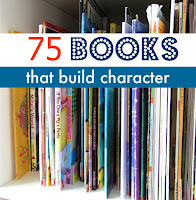 Last week end Allison at No Time for Flash Cards posted a list of 75 books that build character. An anti-bullying flashmob organized by a number of schools in Vancouver was bouncing around Facebook, and my school danced to it at our anti-bullying day assembly. I was meandering through Deep Space Sparkle to see what gems Patty had posted that would inspire me this week. 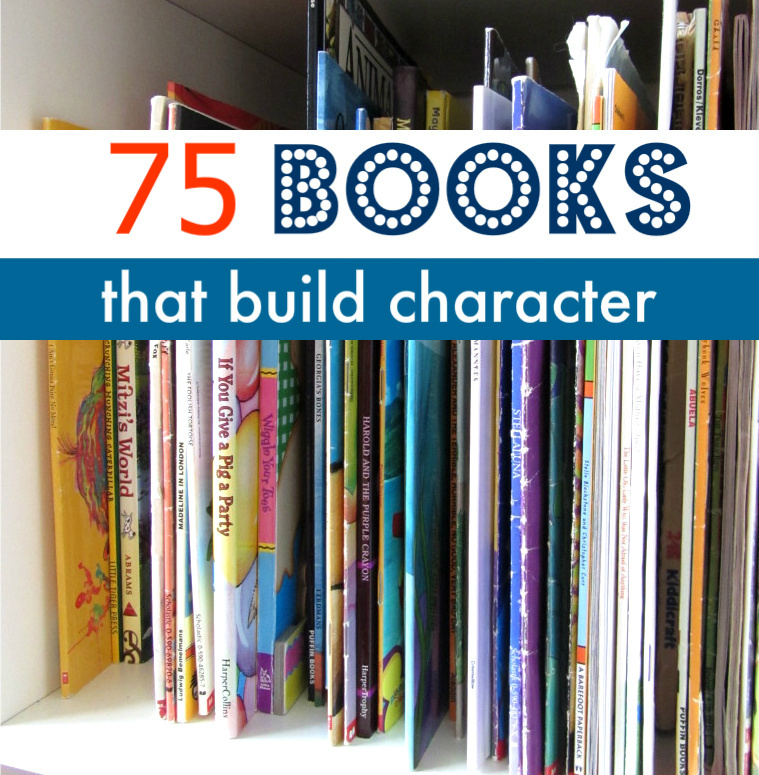 Giraffes Can't Dance is one of the 75 books that Allison includes in her list. 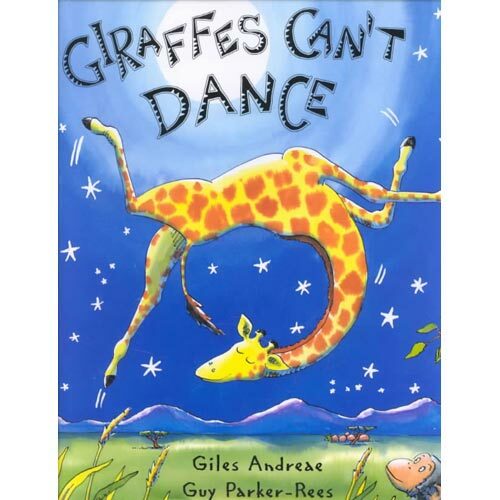 It is about Gerald, a giraffe who is knock kneed and falls on his face when he tries to walk, who is mocked by the other animals when it is his turn to dance at a dance competition, and who finds and exults in his own "moves" when he listens to the music of his heart. The message fit in perfectly with the slogan for anti-bullying day - respect the right to be different. And Patty had posted an art lesson for Gerald. We followed Patty's plan for Gerald's background. She said to draw a line for the grass and sky. (I told the kids to draw it in the middle of the paper - next time I will remember that Patty said to draw it one third of the way up the paper). I watered down yellow and green paint. The children painted the "grass side" yellow, and as soon as they were done, they painted green right on top of the yellow paint. The next day we painted the sky and moon. The kidlets traced around a circle (the frog food container!) and painted watered down blue paint up to the traced circle. Then they used regular white paint to paint the moon - starting in the centre of the circle, spiralling out and blending with the blue sky. 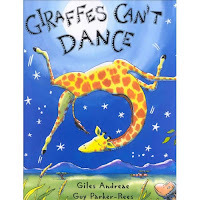 The giraffes were a cut and create activity. I gave the kidlets 7 rectangles. 1 body - 3" x 4"
1 neck - 1.5" x 5"
1 head - 2" x 3"
4 legs - 1" x 5"
The kidlets cut the corners off the body rectangle. They cut the long sides of the neck rectangle so that the sides were not straight like a ruler but wavy like a giraffe neck. 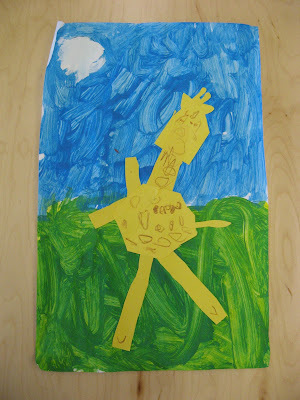 Two corners of the head were snipped off to make a giraffe shaped head. And finally, all four legs had their long sides cut off so that the knees could be knobbly. When the giraffe was all glued together, the kidlets drew spots, manes, hooves and glued on ears, horns and tails.